Television networks, viewers, readers and restauranteurs are paying tribute to Anthony Bourdain this weekend, one day after he was found dead in a hotel room in France. His books are occupying six of the top 10 spots on Amazon's bestsellers list, a sign of immense interest in reading or re-reading his books like "Kitchen Confidential." And some of his past TV shows are re-airing in his honor. On Friday there were pop-up tributes outside Les Halles, the New York restaurant where Bourdain worked in the 1990s. Fans left bouquets and handwritten messages on the walls and door of the shuttered French brasserie. At CNN in Atlanta, a mourner placed a flower and a note next to a poster of Bourdain in the lobby. And at CNN in New York, an employee placed post-it notes with hearts on one of his posters. CNN was Bourdain's home for the past five years, so the loss has caused heartache throughout the organization. The network quickly produced an hour-long remembrance that premiered on Friday night and will re-air Sunday at 10 p.m. ET. Other CNN programs are also honoring Bourdain's legacy. "It is hard to imagine he is gone," Anderson Cooper said Friday night. "Hard to imagine he is not just off on some far away journey, hard to imagine he will not soon return with new foods to share, new stories to tell." Before Bourdain died, CNN had planned to run a marathon of past "Parts Unknown" episodes on Saturday night. 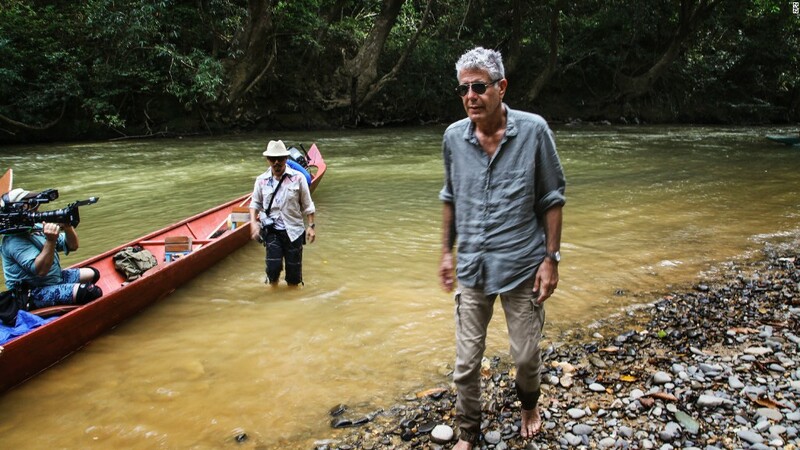 The network is moving forward with that plan, but with an adjustment -- the marathon will feature some of Bourdain's all-time favorite episodes. Additionally, the Travel Channel will air a 12-hour marathon of Bourdain's previous show "No Reservations" on Sunday starting at 7 a.m. Eastern. A new episode of "Parts Unknown" featuring Berlin was already scheduled to premiere Sunday at 9 p.m. CNN says it will still air, but now "with a special introduction by Anderson Cooper." That episode will be followed by the tribute special. "Somebody as vital, as passionate, as alive, as warm as human as Tony Bourdain, I could not imagine, A, that he was gone, and B, that he was gone in this manner," Christiane Amanpour said in an interview for the special. She said his death has "left a massive hole in" the world. All three network nightly newscasts in the U.S. featured the "lifeline" number, 800-273-8255, and encouraged people to call for help. CNN and CNN.com have also been prominently featuring the number. "You never know what goes on in anybody's head and you never really know what goes on anyone's heart," Cooper said in the CNN tribute. "But certainly, you know, the pain he must have been feeling, at least in that moment or in those moments, and the loneliness he must've been feeling -- it's just terribly sad to think about. And makes me very sad for him to have -- to have succumbed to that."